I'm back in Athens after a quite gruesome 12-hour trip by ship. But I can't complain much, as it's my birthday today! So, I'm having the day off... Intense studying starts tomorrow. Hope you have an excellent day too! 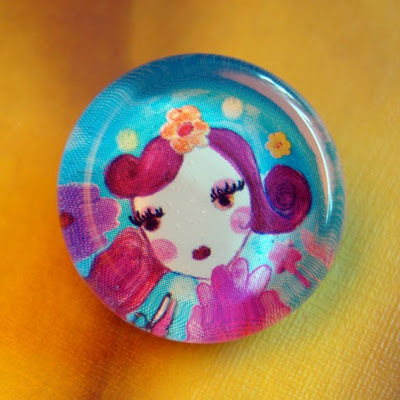 In the picture, my best friend's present: An amazingly cute glass pin, handmade by a friend of hers. Absolutely love it! p.s: Nice blog. This is my first comment here. Xronia polla! Na ta xiliasis!! HAPPY BIRTHDAY LOPI BABE! ;) have fun today. spoil yourself. you deserve it! xronia sou polla!! !e ygeia, agapi kai tyxi!!! Happy, happy birthday! What a great pin. HAPPY HAPPY HAAAAPPPPYYY B-DAY LOPITA!! !teleia pin!! σου ευχομαι πολλες αγορες και φετος! happy b-day girl. Stay true and loving and healthy. hey. Rena comment is mine. Used moms pc and her gmail just got in the way. Anyway... happy happy b-day again. xronia polla kai edw lopi!!!!!! !